Academy Creative are a team of creative professionals based in the North East providing marketing support to schools and colleges. Whether you are looking for a full school rebrand, a new school website, school signage or a printed prospectus, Academy Creative can support you every step of the way. 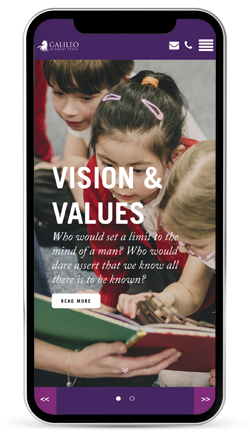 We recently built and launched our our own bespoke website platform for schools. The primary objectives of the system is to offer high-end, professional designs along with an easy to use administration system. Our school website team are here to offer training and ongoing support in a friendly and timely manner. Contact us today to arrange a meeting to discuss your requirements. All of our services aim to add value to your school or college. Whether that is a marketing campaign to increase enrolments or a website to reduce admin time, we work closely with you to reach the desired outcomes. Our websites are fully responsive, meaning you can communicate to your school community effectively. Print services include a range of items including prospectus’, workbooks, diaries and much more. Our design team can create eye-catching bespoke branding that makes your school stand out. Design, supply and installation of a wide range of bespoke signage to suit your schools needs. We are highly experienced in working in school environments and capturing high quality images. We work with your school to promote good news stories to the wider school community. Over recent years the way people view web pages has changed dramatically, with a change towards mobile phone and tablet devices. With this in mind, we develop responsive websites that react to the device they are being viewed on. The website will be fully responsive to all devices and browsers. We are here to help whenever you need support with your website. Built with schools in mind our own bespoke website platform is easy to use, professional and tailored to your needs. Integrated to your social media accounts with a dashboard full of useful data. This feature allows for teachers to share messages and files in a secure login area.